The Greater Killeen Chamber of Commerce has as one of their economic development priorities to “Develop the concepts and methods to create a suitable place to attract and retain talent.” A task force to develop additional processes and methods to create a suitable place to attract and retain talent was established and named Creation of Place Design Team. This white paper discusses the city’s current atmosphere and attributes conducive to supporting a creative class as well as future opportunities that would support a creative class. The first step is to define “creative class.” Dr. Richard Florida, author of The Rise of the Creative Class, describes the creative class as follows: “ . . . the creative class includes 'creative professionals' who work in a wide range of knowledge‐intensive industries such as high‐tech sectors, financial services, the legal and health care professions, and business management. These people engage in creative problem‐solving, drawing on complex bodies of knowledge to solve specific problems. So, now we have some idea what the creative class is. What else do we know about the creative class? The creative class is very talented and very mobile. They pick a place to live and then find a job. They choose to reside in communities where newcomers are accepted quickly into all sorts of social and economic arrangements. They choose to reside in communities that support their lifestyle interests. They want to hear different kinds of music and try different kinds of food. They want to meet and socialize with people unlike themselves, trade views and spar over issues. They value active outdoor recreation. They go where they are welcome and stay where they are well‐treated. And lastly, they crave stimulation, not escape. They want to get into it all, not get away from it all. Knowing more about what the creative class is and what they desire, let’s ask ourselves two questions. 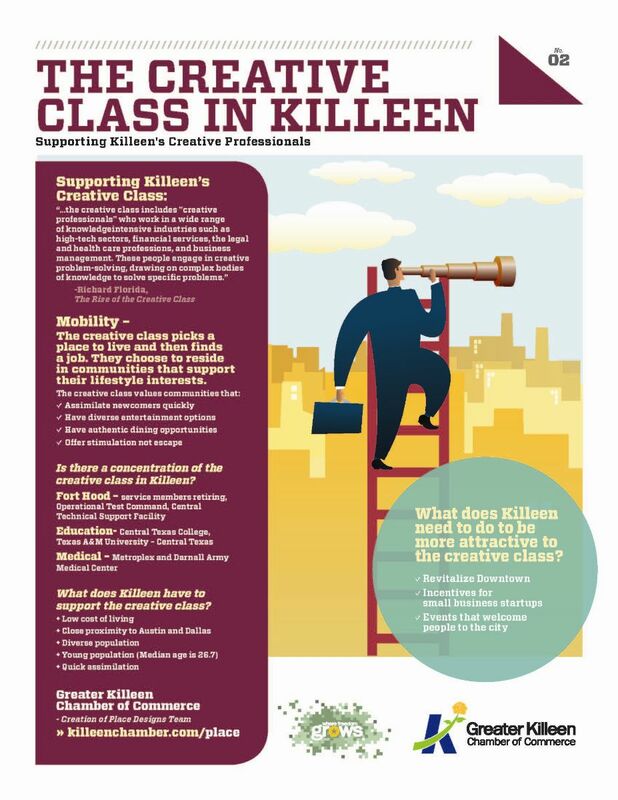 One, is there a concentration of the creative class in Killeen and two, what does Killeen have to support the creative class? The answer to question one is somewhat unknown. Are they creative class individuals living in Killeen? My answer would be yes. Is there a concentration of the creative class in Killeen? My answer would be quite possibly. Ft. Hood is the largest military base in the free world and home to tens of thousands of service members working in many different jobs. As these service members exit, you immediately have a base of potential creative class individuals. Many of these service members have spouses and dependents living with them. When you include these service members’ spouses and dependents, the potential creative class base now expands. Additionally, Fort Hood is home to the OTC (Operational Test Command) as well as CTSF (Central Technical Support Facility) employing in excess of 1000 employees, many in highly technically sophisticated positions. When grouping exiting service members, their spouses and dependents and the OTC and CTSF, you create a potentially large reservoir of creative class individuals. Also, Killeen is home to Central Texas College and Tarleton State University Central Texas. Graduates of these institutions of higher learning comprise a base which exponentially increases the reservoir from which creative class members could emerge. Although there are no hard numbers to validate these assumptions, the shear numbers dictate there are many creative class individuals living in Killeen with the potential for many, many more. So now let’s answer question two. What does Killeen currently have to support any members of the creative class? I would say there are many things Killeen has to offer. Now our last question. What does Killeen need to do to become more attractive to the creative class? We need to make a concentrated effort to revitalize downtown. Downtown Killeen would become an area where people could spend the evening or weekend walking and looking through multi‐cultural shops and art venues, listening to music and eating at small specialty cafes and restaurants or coffee houses. Downtown loft living would be an added bonus especially if “Mom and Pop” groceries, cleaners etc. were located nearby. In addition, downtown could include live theatre, comedy clubs and movie venues. Monetary assistance for the creation of new businesses is needed. This could be accomplished in several ways. The city or Economic Development Corporation could set aside monies that would be used for creative class start‐ups. Many creative class startups will be one and two‐person operations, thereby making start‐up costs relatively low. The amount of money assigned to each new business venture would not be as important as the fact that Killeen is willing to invest in small start‐ups that may grow. Monies could also be used through the establishment of an angel fund. Angel funding is typically an individual who invests his or her own money in a private company, which is typically a startup. An angel investor is not an employee or member of a bank, venture capital firm or other financial institution that normally makes such investments. This angel funding could be expanded to include angel groups and/or angel networks which pool their investment capital. There should be “introduction” events to Killeen sponsored by the city/chamber. The sole purpose of the events would be to bring people to the city and introduce them to its people, restaurants, etc. Festivals of any type that include music and food would work. Positioning Killeen in the minds of the creative class as a “cool” place to live is very important. Killeen needs to market itself more and become more known as the place in Central Texas to meet diverse people. Killeen is such a melting pot you can practically travel the world meeting new people and experiencing new cultures without ever leaving the city. Killeen has much to offer the creative class and with concentrated effort in a few areas Killeen can become the place to visit and live in Central Texas.